Blesseds Jean Louis Loir, Protaise Bourdon and Sebastian Francois were martyrs of the French Revolution and among more than eight hundred priests and religious amassed in the infamous 'pontons de Rochefort' moored near the island of Aix in 1794. Jean-Baptiste was born on March 11, 1720 to Jean-Louis Loir and Elisabeth Juliot, the sixth of eight children. At twenty years of age, in May 1740, he became a Capuchin. He received the Capuchin habit and the name Jean-Louis. He spent most of his religious life in one of two friaries in Lyon, Saint Andrew and Saint Francis, and at least twice held the office of superior. In 1791, the revolutionaries obliged priests and religious to swear allegiance to the civil constitution of the clergy. While Brother Jean-Louis was in Saint Francis Friary, the Constituent Assembly ordered an inventory of the persons and assets of every religious house. At the age of seventy-four, Brother Jean-Louis declared that he wished to remain with the order, but in October he left Lyon and withdrew to Bourbonnais. In 1793, an investigation was ordered and Brother Jean-Louis was transported to Moulins where he and sixty-six rebellious or refractory priests were shut away. On April 2, 1794, Brother Jean-Louis left Moulines in the last of three consignments to Rochefort. 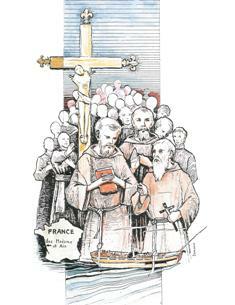 They reached Rochefort toward the end of April and Brother Jean-Louis was transferred to the ship "Deus-Associes". The captain and his crew were prison inmates and onboard more than four hundred persons were literally crammed together in pitiful conditions. Although Brother Jean-Louis endured such sufferings, he fostered courage among his companions. It is even said that he was found dead on the morning of May 19, 1794, kneeling down in his place, as if still in prayer. Protaise Bourdon was born Jean Bourdon Protais on April 3, 1747, in Seez, France and professed religious vows on November 27, 1768. He was ordained a priest in 1775. Displaying a strong attachment to the true faith, Protais refused to take the oath required by the Civil Constitution of the Clergy. On August 26, 1791, he declared in writing his intention to persevere in his Capuchin vocation, refusing to return to secular life or to opt for voluntary exile. He was expelled from the friary in 1792 and on April 10, 1793, he was arrested, interrogated, and sentenced to imprisonment for celebrating eucharist without government authorization, for having in his possession texts regarded as contrary to the principals of the Revolution, and for refusing to take the oath required by the Civil Constituion of the Clergy. He was condemned to deportation to Guyana, and in March 1794, was taken in chains from Rouen to Rochefort on foot. He arrived there on April 12 and was placed aboard the prison ship Deux-Associes and died, most likely of typhus, on August 23, 1794. Sebastian Francois was born Louis-Francois Lebrun on January 17, 1749 in Nancy, France and professed religious vows on November 24, 1769. Following ministry formation, he was ordained a priest. He refused to take the oath required by the Civil Constitution of the Clergy and was imprisoned on January 26, 1794. He was sent to Rochefort and transferred to the prison ship Deux-Associes on May 5, 1794. When he became sick, he was moved to a hospital ship and died May 5, 1794. On October 1, 1995, John Paul II recognized that this sacrifice was the grace of martyrdom. God our Father, you were pleased to adorn Blessed John, Blessed Protaise, and Blessed Sebastian with the palm of martyrdom. They burned with love for you in propagating the faith. Through their prayers grant that we may be firmly rooted in love and merit to experience with them the power of Christ’s resurrection. We ask this through our Lord Jesus Christ, your Son, who lives and reigns with you and the Holy Spirit, one God, for ever and ever.